Devo fans were blessed with another round of live performances this year, all of which were very public events. 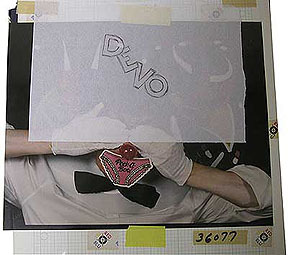 In the recent past, Devo had been performing one-off private/corporate gigs which were closed to the general public, which left most fans out of the loop. The most recent public show was back in 1999 at the Universal Ampitheatre in Los Angeles (with Ween and The Violent Femmes), and I was definitely ready for another Devo-inspired trek across the country. RIGHT: Image of the limited edition Devolve Anaheim button made especially for Devo's live show on 10/2602 - at the Arrowhead Pond hall. We have a limited number for sale here. We arrived in Los Angeles a few days before the Devo show and visited Mark and his peeps at the Mutato building on Sunset Blvd. 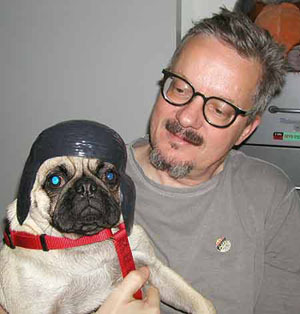 The the left: Mark and one of his dogs, Finster, proudly sporting the New Traditionalist Pomp wig. 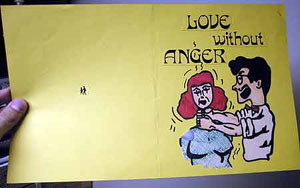 Below/right: During a romp through the Mutato basement archives, I found some original artwork from the Love Without Anger video. 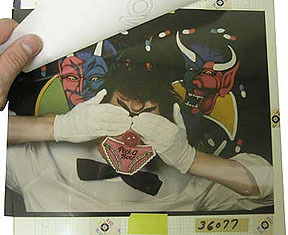 Below: More original artwork from the Mutato archives - for the Peek-A-Boo 7" release. We headed to Anaheim early in the afternoon on Saturday, the day of the Tony Hawk Boom Boom Huck Jam show. We were eager to get to the venue to see where we were sitting, since it was impossible to tell from the online seating charts provided by the venue & Ticketmaster. Below: I was able to sneak into the Arrowhead Pond venue in Anaheim before the show, and I snapped a couple pictures of the pre-show scene. 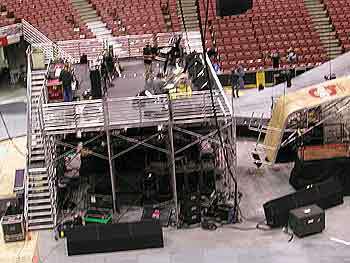 Here's the stage set up, and a view of the ramps, which were set up directly in front of the stage. Among the tiny figures are Bob & Lisa Casale, Alex & Sami Casale, and Tony Hawk. The show turned out to be set up in a most bizarre way, making it nearly impossible for anyone in the audience to get a decent view of Devo. The focus of the event was definitely not on Devo, and the crowd was made up of kids who were there to see skate tricks (and their parents). It was like being at an after school event at which Devo was performing. Weird. 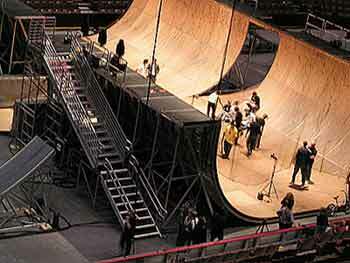 During Devo's set, the skating and BMX stunts continued to be performed in front of the stage (just to the right of the video screen in the photo here). It was odd seeing skateboards and bikes flying through the air while our heros belted out a great set. At one point, Matt Hoffman, a BMX rider, was knocked unconscious after a slip up. I'm sure I wasn't alone in feeling uncomfortable about wanting Devo to continue no matter what Matt's condition...and I was quite relieved when he finally got up & walked away. 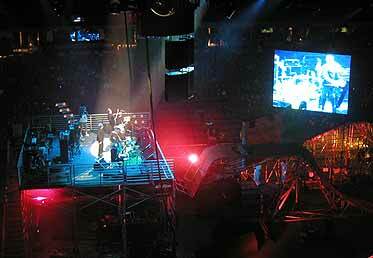 Left: Here's a view of the stage and video screen (which was just in front of the ramp set up) from where JB and I were sitting. My camera didn't have a very good zoom on it, so I couldn't get any really good photos of the performance, unfortunately. I met a few SpudTalk members at the show, including Vahe, who is in regular contact with the Devo boys. Vahe was nice enough to donate his backstage pass to me after the show, which now has it's place in my pile of Devo crap. Thanks, Vahe! 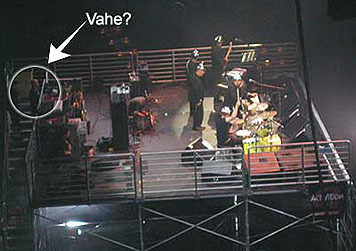 Right: Vahe seen here standing behind the stage as Devo dishes out the tunes. A geek's dream, indeed. We visited Mutato again on Monday before we left for home on Tuesday. During Mark's visit to NC in Sept., He'd asked if he could pick some decorative item from my house in trade for one of his postcard prints - a CPR dummy baby head on a stick. The head had been in my possession for years and was dirty and scuffed, but Mark seemed to like it...so a trade was made. 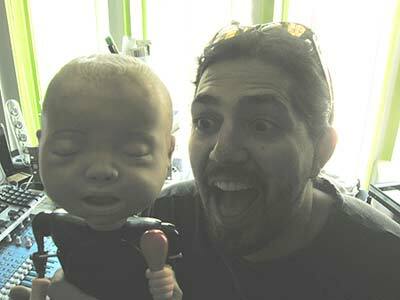 He had it at Mutato, and we began assembling a new toy using a robotic clown he had at the office. He named it "Dirty Baby". Left: Mark tears the clothes from Robot Clown as we prepare to create a new body for Dirty Baby. Albert, who works at Mutato, seen here flirting feverishly with Dirty Baby. Albert has been very instrumental in providing doorprizes, video, and other Devo crap of interest to the annual DEVOtional events that have been happening for the past 2 years. All hail Albert & Dirty Baby!